Spray dirt and filth away with Signature Series Wheel Cleaner. Filthy wheels make any car look neglected and reflects poorly on the driver. Clean and protect wheels, rims, hubcaps, and tires with Chemical Guys Signature Series Wheel Cleaner. 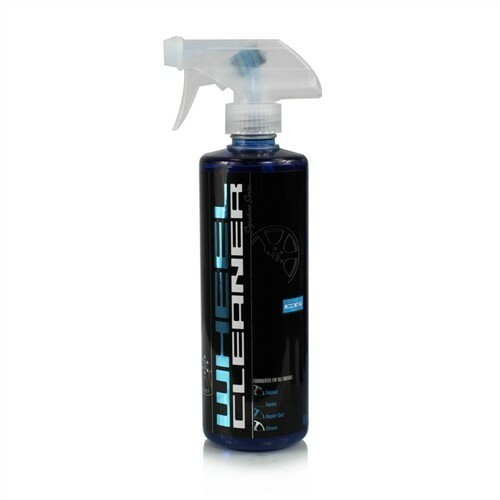 The citrus-based cleaner is tough on brake dust and filth, but gentle and safe for all wheel finishes and materials. Adding Signature Series to normal wheel cleanings during every car wash reduces buildup and corrosion, and protects a pristine showroom shine on wheels and rims. Clean and protect factory alloys, plastic hubcaps and wheel covers, custom aftermarket wheels, and even select vinyl wrapped finishes. Spray down suspension and brake parts to reduce buildup and corrosion with every wheel cleaning. Clean rubber tire sidewalls to ensure tire shine dressings last longer and look better along the way. Simply spray Signature Series Wheel Cleaner on any dirty wheel, then scrub with your favorite wheel brush and soap to remove any traces of dirt, grime, and brake dust. Choose Signature Series Wheel Cleaner for powerful decontamination action with a clean gentle finish.